General Electric shares slid 9% on Friday after the company received its most bearish price target on Wall Street. GE is facing a fundamental problem, the JPMorgan analyst Stephen Tusa said. The company recently reported disappointing quarterly earnings results. General Electric was getting slammed Friday, down more than 9%, after JPMorgan slashed its price target to $6, the lowest on Wall Street. Shares Friday morning were trading at $8.15 apiece, their lowest level since March 2009. „The outcome of GE results was worse than expected on almost all fronts,“ Stephen Tusa, an analyst at JPMorgan, said about the company’s third-quarter earnings. According to Tusa, in the worst case, GE will have $100 billion in liabilities and zero enterprise free cash flow even after slashing its dividend to a penny when it reported its third-quarter results. 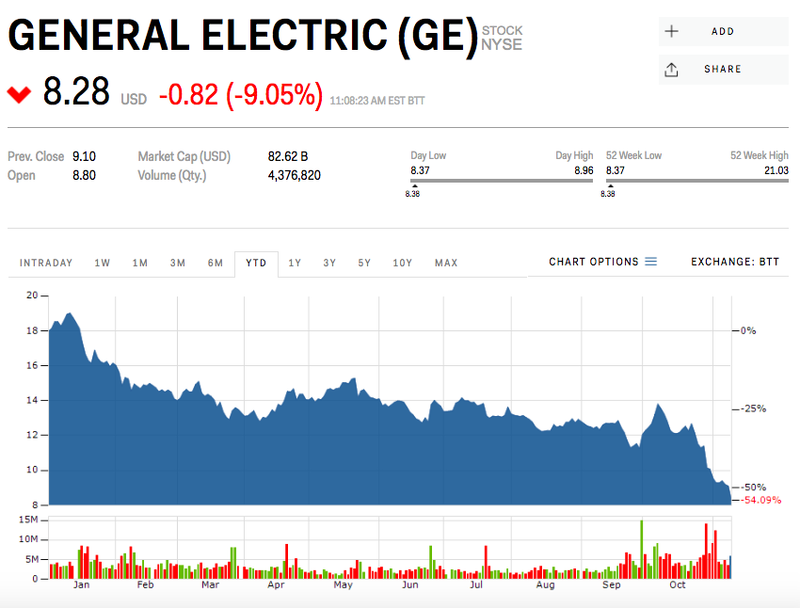 In that quarterly report, GE took a $22 billion write-down to its struggling power business, which it said was being investigated by both the Securities and Exchange Commission and the Department of Justice. When GE first announced the goodwill charge in October, along with the promotion of a new CEO, Lawrence Culp, shares rallied by more than 20% as investors looked past the company’s lagging power business, price-cost pressures compounded by US-China tariffs, and behind-schedule deliveries of its LEAP engine. The stock has since sunk to new lows. „The recent pull back seems capitulatory, but the brief share price increase prior to this on a new CEO, along with sell side upgrades adding to the positive shift in sentiment, still pointing to $1 in EPS potential, did not reflect what we now know around the numbers,“ Tusa said. Shares are down 54% this year.